The lastest Disney/Pixar collaboration uses a very Disneyesque plotline with Pixar's usual brilliant animation. 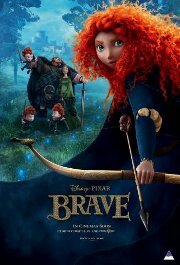 We follow the heroic journey of Merida, a skilled archer and headstrong princess. Determined to change her fate, she defies an age-old custom sacred to the unruly and uproarious lords of the land, unleashing chaos in the kingdom. When she asks an eccentric witch for help, she is granted an ill-fated wish and the ensuing danger forces her to harness all of her resources to undo a beastly curse and discover the meaning of true bravery. This film is releasing in both 2D and 3D, this is the 2D version. Note: the 3D version is a little dark. Action, Adventure, Animated, Comedy, Family, Fantasy, Female interest. Violence Fairly frequent but mild, no bloodiness, no wounds shown. Comments Parental accompaniment is necessary for under 10 due to scenes of mild threat and menace. However, the movie carries a positive message and is heartwarming.